I’ve gained so much from the adventures I have undertaken and had such great times that I take every opportunity to tell other people about them. It’s not that I want to make people jealous but to inspire them to have their own adventures by learning from my mistakes and using my trips and expeditions as a blueprint for their own. The Latest Event Allenburys Adventure Series | September 11 2012. I made a presentation at the Dee River Festival in Llangollen on the 24 March 2012. It was a talk battle so my green team were against Dave F‘s red team. The audience voted in a Ready, Steady, Cook style to decide the winner. It was very exciting, but we lost! Night of Adventure at the Vue Cinema, Leicester Square, London. It was charity event where each speaker had 20 slides that automatically changed after 20 seconds. All I had to do was keep up with my slides! 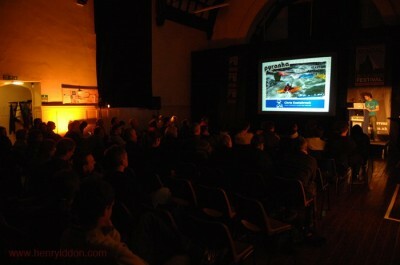 Kendal Mountain Film Festival. I was top of the bill for the Thursday Wild Water Night speaking about my expedition to Tibet a few year previous. It was a great experience and felt very rock ‘n’ roll rubbing shoulders with the mainstream climbing speakers! Canoe Expo. This was a large kayak event that ran a few years back and was the first large event I ever spoke at, I was pretty nervous and in the end did a good job! If you are interested in having me come to your shop, club or venue with some stunning photos, short videos and tales from across the globe please get in contact!